The feature-packed tuner your audience will never see. This highly accurate tuner features a full-color display with four selectable viewing angles (2 vertical, 2 horizontal) in a housing that blends with the aesthetics of any instrument. The advanced tuning algorithms allow you to tune in noisy environments, while the ratchet clamp securely attaches to the instrument to hang tight during live performance. 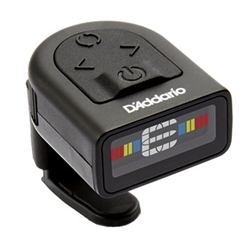 It’s so small, convenient and accurate, you’ll want one for every instrument you own.